With the biggest installed base of any mobile platform, Alphabet’s Android operating system is now on the fast track to take over television, with many expecting Android TV to be the market-leading TV platform by 2025. It is already deployed by over 100 pay TV providers around the globe, with Com Hem in Sweden and Vodafone Australia among the most recent adopters. TiVo has developed an Android TV platform and AT&T is working on a version for its DirecTV streaming box. Android is a software development platform for digital media players and comes in a couple of flavours: Android TV Operator Tier and Android Open Source Project (AOSP). The latter enables operators to build from the pure Android code base, and gives them full control of the platform, including which apps and services to include. The downside is that all the heavy lifting of integration and design is done by the operator, which inevitably demands more time and more money. Android TV Operator Tier is the one that’s caught on like wildfire. It’s a level of certification for an Android TV device that allows companies, such as pay TV operators, to customise the platform from boot-up screens, the UI and even the set-up experience. Many elements of Google software, including Play Store, Chromecast, in-app billing and the Google Assistant, come straight out-of-the-box, all of which slashes development costs and time to market. In exchange, operators do relinquish some control, admit software updates every 90 days and many will still need to seek a partner to tailor the system. Integration of the software with key hardware and a customised UI is needed to differentiate and secure each operator. It’s instructive to know ATV Operator Tier failed to take off on launch in 2014. Operators were concerned about the open software’s security, were reluctant to permit Google prominence on the home screen and sceptical of Google’s true intentions around access to user and advertiser data. In what was presumably one of the most hard won but brilliant boardroom victories in the company’s history, Google came back in 2016 with a revised offer that addressed these issues. Sascha Prüter, the former head of product for Android TV, who is now chief product officer at OTT software provider Vewd, characterises Google’s change as an evolution. Perhaps Google’s core insight was to approach pay TV from a mobile OS perspective. The mobile industry being far bigger than TV, of course. Nor did Google position Android TV as competition for the end-to-end platforms developed by companies who were dominating that space then, such as Cisco, Ericsson or Alcatel. “Android TV is essentially an application framework for enabling development, which made it easier for other pay TV middleware providers to adopt it, because they didn’t see it as a threat,” Prüter says. Operator Tier is deliberately not a complete solution. There are many aspects of Android-based integrations the operator has to understand and manage. There are many things to orchestrate, from how to correctly integrate the Play Store and Google Assistant, to how to comply with all Google’s style guidelines for the remote control, such as the keys on the handset to output, and for the user interface. There is integration with the player to manage, and you need to ensure complete interoperability with all back-office functions. UI performance and optimisation are critical, whether using IPTV/OTT/DVB. And it all has to reliably function with DRM/conditional access. Operators wanting to integrate OTT and broadcast in the set-top box will need many of these additional components and functionality, which is where providers like 3SS, Technicolor, Vewd, Accedo, Synamedia, Amino and others come in. The added value Vewd OS provides, for example, is both turnkey experience and extensive product modules that adhere to core Android TV requirements. This, says Prüter, includes the integration of different regional standards and marrying hybrid linear TV scheduled with broadband on-demand (as with Europe’s HbbTV smart TV platform). Vewd OS augments the platform’s system experience, making it possible for operators to enable live A/B testing or to promote different content on the home screen each week. Vewd also provides back-end systems for management of promotions, app integration, ad insertions and so on. 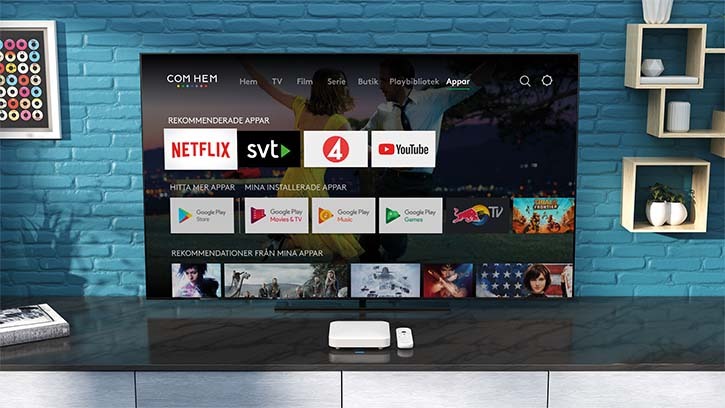 It is fair to say the pairing of 3SS’ 3READY custom launcher with Technicolor’s middleware is the backbone of the project at Swedish cable company Com Hem. Here, the 3READY front end integrates with the middleware, which acts like the engine of the system by bringing together the chipset and the Android TV platform, its APIs and the DVB stack, and enables the 3READY front end to link into all these processes. “As soon as you want to merge OTT and broadcast, then certain challenges arise,” says Jean-Marc Racine, chief product officer of Synamedia. “Broadcast is by far the most efficient way to distribute high-quality content on the big screen, so operators need broadcast security and functionality, like catch-up and PVR, which is where the Android TV model has shortfalls.” Indeed, launching a hybrid Android TV box can take considerable time if you are not careful. Perhaps the biggest benefit of Android TV is access to the Google Play Store, allowing fast-tracked integration of third-party apps. The primary driver for adoption of Android TV is easy access to Netflix, YouTube and Amazon Prime. Vendors can provide all-important UI/UX expertise. That’s because subscribers increasingly expect the TV content selection and viewing experience to mirror that on their mobile devices. There are rules though. Google requires the Play Store gets a prominent position in the UI, but operators are generally happy to do this, reports Blickensdörfer. Also, Google asks for a search button on the remote control for Operator Tier. There are also concerns about ongoing OPEX costs. Google’s update policy applies to STB manufacturers who must comply to keep their Android TV certification. It states that when a new OS is released (eg Android Oreo 9.0), they must apply the new release to all boxes in consumer homes within 90 days. Analyst and researcher Rethink TV registers around 70% of operators globally investigating Android TV as a serious option. Provided Google continues its open approach, Rethink forecasts 99.2 million Android TV devices will ship through pay TV operators by 2022. You have to bear in mind, though, it will take any operator around a decade to replace their entire STB population. The 100 million devices in Rethink’s forecast constitutes less than 11% of TV homes globally – but that’s up from less than 1% in 2017. “Android TV does have traction, but its market share is still small if you look at overall middleware deployment worldwide,” says Racine. Competitors include RDK, the open-source ecosystem devised by US cable giant Comcast, and certain pay TV operatorss own Linux-based solutions. While Android TV Operator Tier is likely to be the de facto technology platform for many second, third tier and new pay TV launches, it may prove challenging for major global operators, such as, Liberty Global, to consider such a close tie-in with Google. Video distribution is increasingly migrating towards personalisation and unicast (OTT), and the entire software and infrastructure ecosystem is evolving to meet this transformation. “I think operator-distributed Android TV is a key transitional platform in the transformation away from broadcast and towards unicast,” says Brickman. “Once broadband networks are sufficiently robust to handle unicasting the World Cup to everyone who wants to watch it, then operator-distributed devices may disappear, as they are increasingly replaced by consumer devices. However, this does not mean the end of Android TV, as needless to say, Android TV can power some of those consumer devices.